Disclaimer: the following information is not professional medical advice, and is provided strictly for informational purposes only. Speak to a doctor if you have tinnitus. The following is a guide to AudioNotch’s software and how it can help to turn down your tinnitus tone. Notched Sound Therapy is a tinnitus treatment that can lower the volume of your tinnitus tone. Developed by global researchers, it takes two broad forms: Notched Music, or Notched White Noise. In summary, Notched Sound therapy is simply audio that has been processed in a particular way. Notched Sound Therapy was developed for individuals who have tinnitus that developed from hearing loss. If you have tinnitus, speak to your doctor first and undergo a full medical evaluation. What are the potential benefits of listening to Notched Sound Therapy? For most users, the most significant benefit of Notched Sound Therapy is a potential reduction in the volume of their tinnitus. Below, we've summarized some of the research that's been done in this space. 43 people were recruited for an experiment to test the efficacy of Tailor-Made Notched White Noise, listening daily for 12 months duration. 4 of 20 users receiving the treatment had their tinnitus tones eliminated entirely. The average reduction in tinnitus volume in the treatment group was approximately 12 dB, or a 75% volume reduction. People listened to 2 hours of Tailor-Made Notched Music daily for 12 months, resulting in an average 26.1% reduction in tinnitus loudness. 24 users were recruited with chronic tinnitus and less than 50 dB of hearing loss to listen to Tailor-Made Notched Music Therapy for 6 hours a day for 5 days. 3 hours after completing only five days of therapy, tinnitus loudness was decreased by approximately 20%, and 31 days later, remained reduced by about 10%. This effect was noted only for Notched Music applied to users with a tinnitus frequency under 8,000 hZ. For Notched Music, it was found that the tinnitus frequency of the user must be under 8,000 hZ (8kHz) for the therapy to work. The original German team that pioneered Tailor-Made Notched Music Therapy enrolled 100 users in a trial to evaluate the efficacy of this same treatment. After a three month duration, tinnitus loudness was found to be decreased in the treatment group. 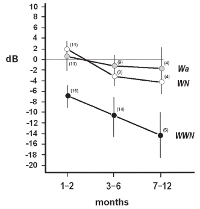 The reduction in loudness was observed to be small, but persisted one month after the cessation of therapy. There's also been additional research into Notched Sound therapy, which we've summarized at a blog post here. Currently, there isn't enough evidence to support the routine use of any particular sound therapy for tinnitus. Because Notched Sound Therapy is an active area of research, AudioNotch cannot guarantee a specific volume reduction. What are the potential risks of listening to Notched Sound Therapy? Listening to any audio at an unsafe volume has the potential to cause hearing loss, but that risk is common to all sound exposure, and not unique to listening to Notched Sound Therapy. In an experiment that tested Notched Music on about 100 participants, researchers asked individuals about potential detrimental effects from listening to audio that’s been notched. After three months of listening to either Notched Music (in the experimental group) or regular music (in the placebo group), participants were asked to report any negative effects they experienced. There was no statistically significant difference in harms between those who listened to Notched Music and those who listened to Regular Music - which seems to suggests that the risks associated with listening to music that has been “notched” are equivalent to the risks associated with listening to music in general. Individuals with tinnitus are most likely simply more sensitive to sounds in general, which is unsurprising given that many individuals with tinnitus also have a concurrent element of hyperacusis (sensitivity to sound). an increased awareness of the tinnitus sound (6.5 %). Users of Notched Sound Therapy may experience the aforementioned issues. Changes in tinnitus tone frequency and/or volume may also result in psychological stress (note that there was no statistically significant difference in psychological stress between those who listened to regular music and those who listened to notched music). What if listening to Notched Sound Therapy temporarily increases the volume of one's tinnitus? AudioNotch is fully automated software that allows you to create your own Notched Sound Therapy and listen to it. Although it’s possible to process audio with other software in order to create Notched Sound Therapy, AudioNotch makes this process simpler and easier. AudioNotch’s software is available online through our web application and also as a mobile app for iOS and Android smartphones. How Do I Use AudioNotch? Use our tuner to find the frequency of your Tinnitus tone. This will be used to create custom sound therapy. Upload your favorite music, or use our sounds. AudioNotch then processes the sounds to create custom sound therapy tailored for you. Listen to your sound therapy for an average of 1 hour daily. You will notice an improvement in your tinnitus after several days of treatment and the volume will be further reduced over time. You can use any mp3 music player or your computer to listen to the therapy. Can Tailor-Made Notched Sound Therapy Help Me? If you have tinnitus, speak to a doctor first. Your tinnitus may require further investigation and treatment from a doctor. Notched Sound Therapy comes with two variants: Notched White Noise and Notched Music. Now, let's examine the user profiles of the participants in the Notched Music experiment conducted in Germany. (i) Chronic (≥3 months), tonal (i.e. beep- or whistle-like) tinnitus with (ii) dominant tinnitus frequencies between 1 and 12 kHz, and (iii) without hearing loss above 70 dB HL in the frequency ranges of one half octave above and below the tinnitus frequency. In the case of bilateral tinnitus, the dominant tinnitus frequency should not differ between ears according to participants’ reports. Aged between 18 and 70 years. Another study seemed to indicate that Notched Music is better for individuals who have a tinnitus frequency under 8 kHz, although in the experiment above, participants with up to 12 kHz tinnitus tones were recruited. What if I have multiple tinnitus tones? If you have multiple tinnitus tones, you can match them as needed. However, our software was only designed to treat one tinnitus tone at a time. Notch White Noise at the first frequency, f1. Notch the song at f2 to create a second notch at f2. Now the file is notched at f1 and f2. How accurately do I have to tune? We do have some tolerance built into our procedure for notching audio. As long as a user’s tinnitus frequency falls within the width of the notch, then they have adequately matched their tinnitus frequency. The notch width is actually based on the average frequency selectivity of a person, and is two equivalent rectangular bandwidths (ERB). The ERB is dependent on frequency, so if your tinnitus frequency is 10,000 Hz (10 kHz), the ERB is about 1000 Hz, which means you’d have to get within a 1000Hz of your true tinnitus frequency (ERB = 107.94*f +24.7 = 107.94*10 + 24.7 = 1104 Hz). Some people notice a (small) immediate drop in the volume of their tinnitus upon listening to white noise for 2 minutes when the therapy has been correctly tuned. Is there a difference between sound therapies? Yes. There are differences in what type of users a particular type of Notched Sound Therapy is effective in. How strong is the evidence for Notched Sound Therapy? The available evidence in favour of Notched Sound Therapy can be found here and here. Multiple newer sound therapies have been developed in recent years, typically with an intent to commercialize them. Since profit can be a motivator that sways the results of scientific studies, it’s important to retain a healthy skepticism with respect to individual newer sound therapy options (there are quite a few). Most of the studies in this space have a limited sample size and haven’t been replicated by independent groups of researchers. "Overall there is currently insufficient evidence to support or refute the routine use of individual sound therapy options. It is likely, however, that sound therapy combined with education and counseling is generally helpful to patients." Notched Sound Therapy involves identifying a user’s tinnitus frequency, and then processing audio by removing the sound energy at and around their tinnitus frequency. White noise or music can be notched, resulted in Notched White Noise or Notched Music. Sustained listening to these sounds is thought to reduce tinnitus tone volume via lateral inhibition of the tinnitus-producing auditory neurons. It was developed by independent groups of Italian and German researchers, which initially produced a 75% and 26% volume reduction respectively. A larger subsequent clinical trial revealed a smaller volume reduction with Notched Music than that observed in the initial Notched Music experiments. A critical review of Notched Sound Therapy concluded that there is still insufficient evidence to recommend it for standard clinical use. Additional research is available here. How long does Notched Sound Therapy take to work? We've reproduced the graph of volume reduction from Lugli, 2009 (1) which illustrates the average volume reduction seen in patients. WWN refers to Notched White Noise Therapy, and the other two lines represent control treatments (i.e. non-notched white noise). As can be seen, a gradual volume reduction should be expected, which increases with months of therapy. As such, it’s important to spend several months listening to the notched sounds as users did in the experiments conducted with Notched Sound Therapy. This therapy has only recently been discovered and there haven't been multi-year follow-up studies done on users. It's possible that if you totally stop using the therapy (after listening to the therapy for several months), your tinnitus volume reduction will be partially reversed (or even completely reversed). Fortunately, if this occurs, you can simply re-initiate listening to the therapy and reduce your tinnitus volume once again. Why must I re-check my tinnitus frequency during treatment? Over the course of several months of treatment, it is possible that the frequency of your tinnitus will shift one or more times. This is normal, and may occur as a response to treatment. If the "notch" does NOT line up with your tinnitus frequency, then the therapy will NOT work. The "notch" must line up with your tinnitus frequency in order to see a therapeutic benefit. Therefore, we recommend retesting (using our tuner app) your tinnitus frequency multiple times during your course of treatment. We have recommended once a week testing for the first month of treatment,and once every two weeks for the months following that. In order to assist users in implementing the AudioNotch tinnitus treatment, we’ve offered a simple recommended Treatment Plan based on the scientific evidence available thus far. Tinnitus sufferers should rightfully be skeptical of any treatments claiming to cure tinnitus, many of these claims are made without any scientific evidence. Furthermore, even treatments with scientific support are often based on small studies that require more follow-up research. Tailor-Made Notched Sound Therapy is based on several experiments conducted by independent groups of researchers. We encourage our customers to review the original scientific evidence that AudioNotch is based on. We have also included a link to a critical review of Notched Sound Therapy. In summary, the evidence for Notched Sound Therapy is preliminary and warrants larger scale studies in order to make more definitive conclusions about its efficacy. In the meantime, we have sought to make this promising approach available to users now, in an effort to help them. For your convenience, we have included links for these papers below. AudioNotch Inc. is an independent company, and we are unaffiliated with any of the scientists who have completed this research. Please refer to the How it Works section of our site for a simplified technical explanation of our treatment. The scientific explanation is complex but we’ve tried to translate it into understandable terms using certain visualizations. Briefly, a combination of lateral inhibition and subsequent changes in the auditory cortex via cortical plasticity appear to be implicated. (2) Selectively stimulating the auditory neurons that don’t produce the tinnitus frequency appears to laterally inhibit the auditory neurons that do produce the tinnitus frequency. (2) Sustained lateral inhibition rewires the connections between neurons in the auditory cortex so that the baseline level of inhibition increases (even when users aren’t listening to the music). (2) Therefore the tinnitus volume decreases. What is the recommended treatment plan? The AudioNotch Treatment Plan accounts for the fact that a user’s tinnitus frequency may shift during the course of treatment. When listening, please be careful to keep a comfortable volume! High volume listening may damage your hearing and worsen your tinnitus! We recommend listening to AudioNotch an hour per day. Try to spread listening out over the day (i.e. different sessions during morning, afternoon, and night). If helpful, increase to 2 to 3 hours daily. We recommend that you use headphones that block out external environmental noise, such as noise-cancelling headphones or in-ear headphones.Typically, circumferential (over-ear headphones) are effective in doing so. As an alternative, noise-cancelling headphones may be used. In-ear earbuds may also be effective provided that they effectively block out external audio. How loud should the therapy be? As before, when listening, please be careful to listen at a safe volume! High volume listening may damage your hearing and worsen your tinnitus. Listen to the sound therapy at approximately the volume of your tinnitus, but do not exceed a safe volume level. What support does AudioNotch provide? AudioNotch provides support via e-mail for the duration of the subscription. Typically, we reply within one to two business days to all support queries. Does the use of mp3s compromise the treatment? No. While AudioNotch distributes Tailor-Made Sound Therapy as MPEG-3 files, we have taken care to ensure that the sound is of the appropriate quality. Using mp3 files allows us to support the widest range of playback devices for the largest number of tinnitus sufferers. From a more technical perspective, we ensure that for users with a high frequency tone (i.e. over 8000 Hz), no low-pass filtering occurs in the mp3 encoding. For those with a high frequency tone, we also encode using a high bitrate of 320kbps. Due to signal processing theory, an increased bit rate is not necessary for individuals with a lower frequency tone. Should I listen in both ears if I have tinnitus in one ear? A lot of people who have unilateral tinnitus (tinnitus in only one ear) write to ask me if they should listen to AudioNotch in both ears, given that only one ear is affected. The answer? Interestingly, you should listen in both ears even if your tinnitus is only in one ear. It’s a counterintuitive answer. The reason is because the experiments the therapy is based on treated people in both ears, even if they had unilateral tinnitus (tinnitus in one ear). This approach may have been effective because tinnitus is a phenomenon that occurs in the auditory cortex in the brain, and both ears feed input into the auditory cortex. The neurons that spontaneously fire in this region, thereby producing the tinnitus tone, may still be influenced by input from the contralateral ear. Purchasing an AudioNotch program entitles you to technical support over e-mail to assist with the use of AudioNotch software (note that we do not provide medical advice or evaluations via e-mail, only software technical support). Most e-mail queries are answered within 1-2 business days. We provide an unconditional 30-day money back guarantee for purchases made through our website. However we cannot provide refunds for in-app purchages made from our mobile apps. It seems likely that a proportion of tinnitus sufferers will experience a sensation of increased tinnitus loudness with any sustained exposure to audio of any kind. Some Notched Sound Therapy users experience an increase a temporary increase in tinnitus volume after listening to therapy. This is evident immediately when first listening to the sound therapy. Based on our experience and analysis of the literature, this increase in tinnitus volume is temporary and reversible with the cessation of therapy, and if it occurs to an individual, occurs when they first listen to audio that has been processed with a notching algorithm. Incorrect detection of tinnitus frequency, resulting in a "Notch" that does not overlay the user’s actual tinnitus frequency. Listening to Notched Sound Therapy at an unsafe volume level, as any loud noise can exacerbate tinnitus if it is too loud. Some users have correctly detected their tinnitus frequency and listen at a safe volume level, and despite this, they experience an increase in the volume of their tinnitus. This may or may not be due to an auditory illusion known as a "Zwicker tone", or it may be due to that person’s particular reaction to listening to audio that has been notched. Verify that the therapy is in fact not working. For example, sometimes immediately following a session of Notched Sound Therapy, one’s tinnitus volume might temporarily increase, however, one could still experience a net decrease in their baseline tinnitus volume, resulting in an overall decrease in tinnitus volume. Verify that you have correctly detected your tinnitus frequency (to the best of your ability) and that you are not listening at an unsafe volume level. If the above steps fail, stop listening to Notched Sound Therapy. After a rest period, your baseline tinnitus volume will return to its normal level. Then, request a refund via e-mail (support@audionotch.com) as per our normal refund policy (this policy allows for a refund within 30 days. In our experience all events of temporary increase in baseline tinnitus volume have occurred within this time initial time span). The temporary increase in tinnitus volume appears to occur in 5-10% of users, and is reversible upon cessation of the therapy. Lugli M, Romani R, Ponzi S, Bacciu S, Parmigiani S (2009) The windowed sound therapy: a new empirical approach for an effective personalized treatment of tinnitus. Int Tinnitus J 15:51-61. Okamoto H, Stracke H, Stoll W, Pantev C (2010) Listening to tailor-made notched music reduces tinnitus loudness and tinnitus-related auditory cortex activity. Proc Natl Acad Sci U S A 107: 1207-1210. Teismann, H., Okamoto, H., Pantev, C. (2011). Short and intense tailor-made notched music training against tinnitus: The tinnitus frequency matters. Plos ONE, 6, 1-8. Eggermont, J.J., Roberts, L.E. (2004). The neuroscience of tinnitus. Trends in neurosciences, 27, 676-82. Rajan, R. (1998). Receptor organ damage causes loss of cortical surround inhibition without topograhic map plasticity. Nature Neuroscience, 1, 138-143. Dobie RA (2003) Depression and tinnitus. Otolaryngol Clin North Am 36: 383–388. Jastreboff PJ (1990) Phantom auditory perception (tinnitus): mechanisms of generation and perception. Neurosci Res 8: 221–254. Heller AJ (2003) Classiﬁcation and epidemiology of tinnitus. Otolaryngol Clin North Am 36:239–248. Saunders JC (2007) The role of central nervous system plasticity in tinnitus. J Commun Disord 40:313–334. Rauschecker JP, Leaver AM, Muhlau M (2010) Tuning out the noise: limbic-auditory interactions in tinnitus. Neuron 66: 819–826.